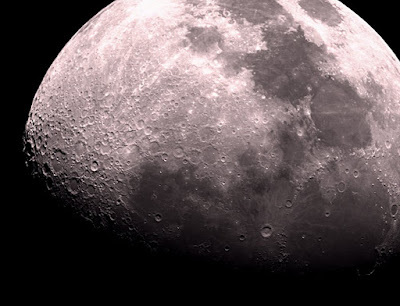 Mining the moon for minerals is not likely to be profitable. This explains the dearth of debate on the topic (and the fact that there are no moon mines). If, as the latest anti-nuclear arguments insist, nuclear energy is also not profitable, why are we debating the topic? In reality, nuclear generated electricity has proven to be profitable, otherwise, like moon mines, they would not exist. Unlike moon mines, there are lots of nuclear power plants planned as well as currently under construction and many hundreds already humming along producing gargantuan amounts of affordable low carbon electricity. Nuclear cost arguments are largely academic because we don't get to pick what the market decides to build. If investors don't see a reasonable potential for profit, they won't invest in nuclear ...or solar, or wind. 1) Wind and solar, especially with a super grid to make them feasible, are also more expensive than coal and require government assistance in the market. The cost argument against nuclear is equally applicable to wind and solar. 2) A renewable grid capable of lighting two coasts and everything in between every night is an untested hypothesis. I'd rather see nuclear join forces with a renewable grid to defeat King coal, which would work, no question about it. Not sure it's smart betting our children's futures on an untested hypothesis. Try to keep in mind that an argument in favor of nuclear generated electricity is not an argument against other low carbon forms of energy. Obviously, there are many economically feasible, mutually beneficial ways to make electricity depending on circumstances. Here in the Pacific Northwest we are presently idling wind turbines and giving hydro power away. That does not mean that hydro is the answer to the world's energy needs. We will need a mix of energy sources. Nuclear-promoting regulators inspire even less confidence. The International Atomic Energy Agency's (IAEA) 2005 estimate ...of about 4,000 Chernobyl deaths contrasts with a rigorous 2009 review of 5,000 mainly Slavic-language scientific papers the IAEA overlooked. It found deaths approaching a million through 2004, nearly 170,000 of them in North America. The total toll now exceeds a million, plus a half-trillion dollars' economic damage. The fallout reached four continents, just as the jet stream could swiftly carry Fukushima fallout. Like John Vidal and many others, Helen Caldicott pointed me to a book which claims that 985,000 people have died as a result of the disaster(14). Translated from Russian and published by the Annals of the New York Academy of Sciences, this is the only document which looks scientific and appears to support the wild claims made by greens about Chernobyl. With the old arguments beginning to crumble all around them, nuclear energy critics have been rallying around the newer cost argument. If there were mines on the moon producing a significant amount of our minerals you could argue about their costs but there are no mines on the moon. There are a lot of nuclear power plants producing a very significant percentage of the electricity generation on this planet at very affordable prices and these power plants have the lowest environmental footprint of any power source. As the cost argument begins to crumble (more cost efficient and safe nuclear plants are built), critics are expanding it to include the length of time it takes to build a conventional nuclear power plant--as if it won't take a long time to build a renewable energy grid. It took years to design and build the Nissan Leaf. If your car were custom designed from scratch like a typical nuclear plant of today it would have cost you tens of millions of dollars. Standardized nuclear power plant designs could be built fast and cheap as was done in France, which gets over 70 percent of its power from nuclear. 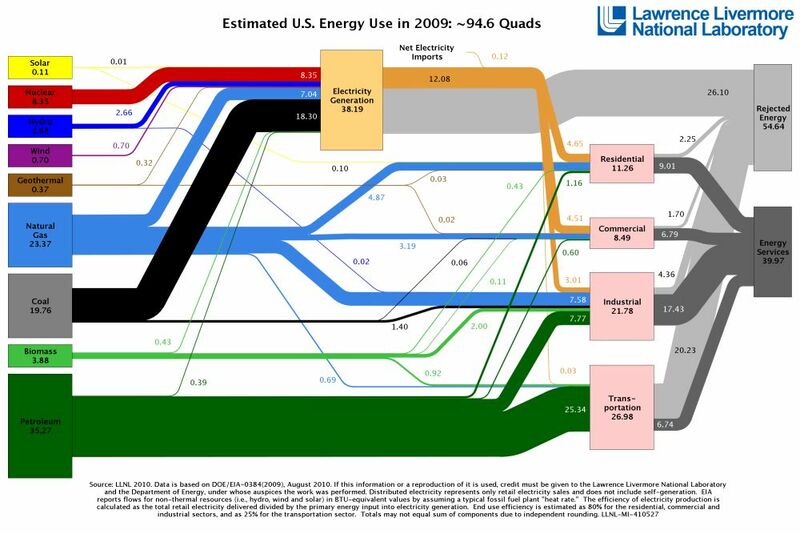 This chart puts into perspective the magnitude of what we face. Now ask yourself, is wise to exclude a low carbon energy source like nuclear from the mix? Look at those threads that represent wind and solar. To eliminate oil we need to greatly increase the electrification of transport, which means generating even more clean electricity. Note that most biomass goes to industry, which means that it is mostly the burning of waste wood chips at places like sawmills etc. The thread that branches off of that is corn ethanol and 70 percent of the energy in a gallon of corn ethanol comes from fossil fuels.